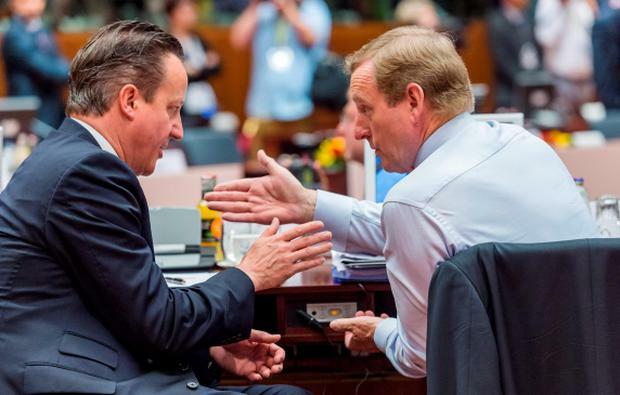 Today Enda Kenny will make probably his most important speech as Taoiseach. Speaking to the CBI in London, he will set out the dangers and, indeed, the cost to Ireland were Britain to leave the EU. He also has an opportunity to set out how we can help Britain in the negotiations with other EU partners. Since the foundation of this State and the winning of independence, Ireland's decision to join the EU has been the clear high point of Irish foreign policy. We couldn't have joined without the British. The question now is can we stay if they were to leave? While Enda Kenny cannot directly influence the forthcoming British referendum, as Taoiseach, he has the primary responsibility to explain to a British audience the implications for Ireland. After becoming prime minister and under continuing pressure from his own party and also from Ukip, David Cameron committed himself to a major renegotiation of Britain's terms of membership of the EU and to holding an in/out referendum. This referendum is likely to take place between the middle of 2016 and the middle or end of 2017. David Cameron will set out to other EU member states what he needs from them so that he can put the question to the British public. So what does he need? Firstly, he need a recognition that the EU is a multiple currency union. Also a recognition that the eurozone cannot take decisions that negatively affect Britain or other non-euro countries. A central concern of David Cameron is to protect the City of London from deeper EU regulation and supervision. George Osborne, in particular, has insisted that Britain must not be obliged to pay for the costs of eurozone bailouts. Secondly, he needs a commitment to future treaty change on the issue of "ever closer union". David Cameron has repeatedly expressed his opposition to the concept of "an ever closer union among the peoples of Europe", which was used in the preamble to the Treaty of Rome. British eurosceptics would prefer if the EU was a free-trade organisation only. The truth is that the EU is a dynamic, constantly evolving organisation. Thirdly, David Cameron wants to strengthen the role of national parliaments. Under the Lisbon Treaty, a third or more national parliaments can temporarily block draft EU legislation. A greater role and a possible brake mechanism for national parliaments in EU decision-making may be possible to negotiate as one of his demands. Finally, and central to the renegotiation, is an attempt by Britain to restrict benefit tourism. The free movement of workers is one of the core principles of the EU and any changes will be resisted by all EU members states - and fiercely so by countries which are a source of migrant workers to Britain. There may be some wriggle room on this very sensitive issue after a recent European Court judgment which states that member states have the power to restrict access to social benefits to migrants who have not been in paid employment in the host country. The solution may be for Britain and the EU to accept the reality of what is already happening. The EU is already experiencing differing levels of integration. A two-speed Europe already exists. German Chancellor Angela Merkel and other creditor counties badly need Britain to remain inside the tent. She will lead the compromises that have to be found. However, I detect a growing hostility from France, Spain and Italy in their attitude to the British negotiation. Certainly, David Cameron wants to do a deal with his European partners and to win the referendum. Defeat in the referendum is likely to lead to his resignation. A British decision to leave the EU will be profoundly disruptive for Britain, for the EU and for Ireland. Today's speech by the Taoiseach in London will set down a clear marker of our interest in this crucial decision.